The Tools Menu allows you to perform a variety of operations on the input file - the "input file" is the file that is currently open in DVMP Pro. The operations all produce new output files, so the input file is left unchanged - unless you are using a tool in the "Direct File Processing" menu. Some tools are only supported for specific file types - for example, the tool "Modify DV Metadata" is only supported for DV file types. Notice that tools which are only supported for DV file types appear towards the bottom of the Tools menu. See the table below for a comprehensive list of the file types supported for each tool. Note that at present for the DV AVI file type, most of the Tools operations can only be performed on standard "dvsd" DV AVI files. So Canopus, DVCPRO25, DVCAM and Raw DV files are not supported here, although DVMP Pro can play them. 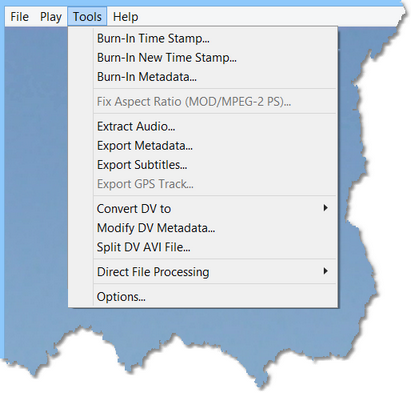 Some of the tools are available for DV MOV files; and Raw DV files can be converted to AVI type 1 or type 2 files. Many of the Tools operations can also be performed on AVCHD, HDV, MPEG-2 PS, MOV and MP4 files. Unsupported operations are greyed-out in the Tools menu. The table below summarizes the available tools and the file types that are supported at present on the Tools menu. The MPEG-2 PS type means files from standard definition Sony HDD and DVD camcorders, and the MOD file type. Note that the "Export GPS Track" tool will only work for files that actually contain GPS data (i.e. the camera has a built-in GPS unit that was activated and storing GPS data while recording). Many of the tools have several options that can be set via the Tools > Options menu. See the Options chapter for further details. The Batch processor also provides a set of tools which are similar to those above, but can process lots of files in one go - see the Batch Processing chapter for more details. The Batch Processor also has four additional tools. The first is called Append Start Date/Time to file name which extracts the date and time of recording from the file's embedded metadata and then renames the file with the date and time added to the end of the file name (e.g. myfile.m2t becomes myfile 2009-01-28 10.23.58.m2t). The second and third tools are called Set "Date created" to Start Date/Time and Set "Date modified" to Start Date/Time which set the "Date created" or "Date modified" file property to the date and time of recording. These three tools work for all the supported file types, and they allow you to see at a glance when all of your video files were recorded. The fourth additional tool in the Batch Processor is called Fix Premiere Start Timecode in DV AVI which adds or corrects an Adobe Premiere Start Timecode header in DV AVI files. Please see the Batch Processing chapter for further details.